This traditionally built stone house was constructed in the 1850's for our grandfather who was a boat builder, harbour master and skipper. There is private off road parking for two cars and a waterside summerhouse and patio which is ideal for watching life on Noss Creek and keeping an eye on children crabbing on Pope's Quay just below. There is a private quay if you wish to bring or hire a dingy. A cot, highchair and stair gate are all available if required. The local pub, the Swan Inn is just next door and the famous Ship Inn just a few minutes walk down the road. At low tide the 'voss' allows a five minute walk to the Dolphin Inn, post office and shops of Newton Ferrers. There is full gas central heating and all gas and electricity are included in the rental cost. I'm afraid we don't allow pets. Free broadband Wi-Fi is available throughout the house and most laptops and phones will connect out on the patio! During the main summer season we will only take bookings from Friday to Friday. Outside the summer season we can be more flexible. The Swan are happy for you to order your meals and have them delivered either to the house or to the patio. Brothers Ian & David own the home between them. Ian has three grown up children who all love Noss and David has two teenage children who love it too! We both remember many happy holidays in Noss as children crabbing, fishing and messing about in boats. Now our own children and grandchildren are enjoying these same things. Our Grandfather bought the house in the 1920s and our mother was brought up there. Dave loves the peace and quiet of an early morning coffee on the patio with only the sounds of the birds and a rowing boat coming in on the tide. Ian's favourite time is coming home to a warm and cosy house after a freezing winter walk around the coast where the waves were crashing on the rocks. But we both like being able to pop next door to the Swan for a beer, ordering a meal to be delivered to our private patio and watching the sun go down. The children love being allowed to go to the park and the tennis courts independently, and playing games in the woods. Unlike most properties in the village we have off road parking for two cars. Wake up every morning to the ever changing scene of the tidal estuary and the wooded hillside opposite. Upstairs bathroom with toilet, bath and basin. Downstairs bathroom with toilet, basin and shower. The house is located in the main part of the village just below the church and next to one of the pubs. The summerhouse across the road is ideal for watching life on the creek. The Swan Inn will deliver your food to the patio on request. Just across the road from the house is the summerhouse and patio. The summerhouse is ideal for being outside when the weather is less than perfect. There is outdoor seating and dining space for six. Beds will be made up on arrival. Lounge has two sofas, LCD TV, DVD player, radio. Dining room has table, chairs, cupboards, bookcase with small library and children's toys. Filter coffee machine and cafetier. Four ring Neff gas hob, Bosch electric oven, fridge / freezer, dishwasher, toaster, filter coffee machine and blender. Plenty of crockery and cutlery, pots, pans, garlic press etc. Summer house and patio across the road overlooking the creek with table, chairs and sun shade. There is a dry ski slope in Plymouth. Tennis courts at the end of the village less than 10 mins walk. There is a 33 bay driving range at Plymouth Golf Centre. Staddon Heights Golf Club (18 holes) boasts a spectacular view over Plymouth Sound. Notes on accommodation: The house is very family friendly and you will not have to rush round moving lots of ornaments above the danger level when you arrive! Please let us know when you book if you wish to use the trundle (single) bed in the master bedroom. We do not allow pets. Outside: There is a patio and summerhouse across the road right above the water which has a table and chairs. The Swan Inn is just next door and will deliver your meals directly to the patio. Utility Room: Washer-drier, microwave and dishwasher. Cleaning / Towels / Linen: Bedlinen, towels and tea towels are included and beds will be made up ready when you arrive. The house will be cleaned before and after your stay. Please bring your own beach towels. Other: Porch has space for wellies, shoes, crabbing lines, buckets, spades, sun shade and paddles. lovely comfy and spacious house in lovely location. The house is thoughtfully furnished and well equipped which made for a really comfortable stay. Nice touches like hand soap and loo roll, bin bags and washing up liquid much appreciated!! Being so close to the water was a real treat and we loved being able to just look out of the window to see the river or step across the road to the riverside patio area. Well prepared for our arrival, with nice comfy beds, the house was instantly homely to walk into. Amazing Wi Fi - better than at home. Will hopefully return as I could never have enough of Noss and Newton!! Thank you for your lovely review. It's so nice to hear that you liked 53 and Noss Mayo! We hope to welcome you back at some time in the future. Staying in Noss Mayo over the Christmas period was magical. The area is picture postcard, the two pubs were friendly and festive. The cottage was warm and comfortable, with a great summer house and terrace to watch the tide ebb and flow. I would highly recommend this cottage and the area for both a summer or winter break. 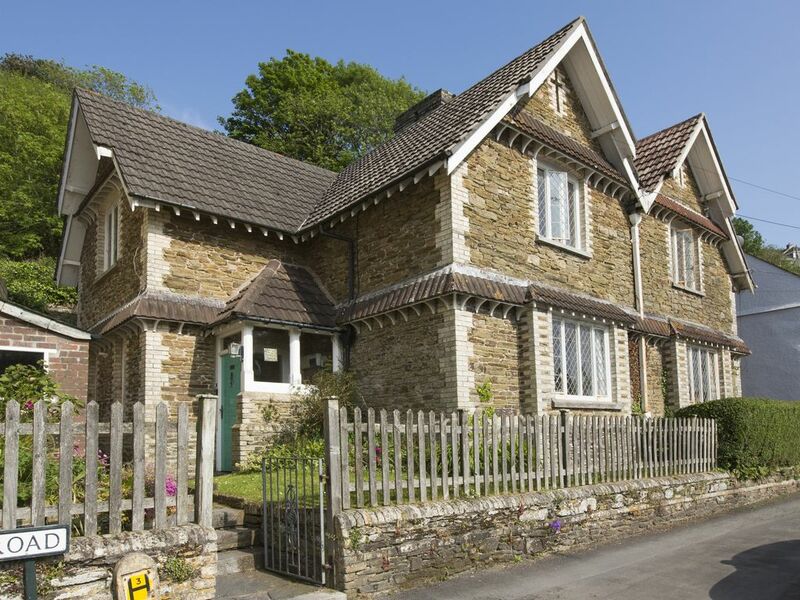 Great base location for visiting the surrounding area, including beaches and Dartmoor. Thanks so much for your kind review. I'm so pleased to hear that you had such a lovely time and that you liked number 53 and Noss Mayo! We hope to welcome you back some other time - perhaps a summer visit? We enjoyed a few days at No 53 in November. The property is clean, spacious and very comfortable and well equipped. The view of the creek is great and when the weather was bad we enjoyed sitting in the summer house simply watching the tide come in! Lots of great walking in the area, we were here for four nights and never used the car. The off road parking is a big plus. We had a meal in the Swan next door which was good and very friendly service.We have no hesitation in recommending it. Thank you for your lovely review and I'm so glad to hear that you had a good time and that you liked the house and the village. We would love to welcome you back to number 53 at some time in the future. Thanks for your kind review and we'd love to welcome you back to 53 Noss Mayo at some time in the future. This cottage is very comfortable and homely and has lovely views out onto the creek. It is very clean and well equipped throughout and has everything you need for you stay. We cooked some meals, but also made use of the two local pubs, The Swan and The Ship really close by who also had good real ale! There is also another pub across the river in Newton Ferrers, but that was closed Whilst we were there. There are lots of footpaths to explore and we were really interested in the changes in the tidal river observed from the delightful summerhouse on the terrace. We would definitely recommend this cottage to others, but hope not everyone books as we want to come back! Thanks for your kind review. I'm very glad to hear you had a good time at 53 Noss Mayo. We'd love to welcome you back at some time in the future. We (four adults) really enjoyed our week's stay. The house and village were a real joy. While not an uber smart Instagram house Waterside Cottage is a real holiday home - very comfortable, with everything you need, and in a fantastic location. The kitchen is well equipped, the beds are comfortable, the shower strong, the cottage has parking- and the locals super- friendly. This is a place where you could stay put and enjoy yourself or use it as a base to explore. We spent hours sitting /eating/drinking on the river side patio enjoying the ever-changing views and people watching. It was extremely handy for a pub(with restaurant)- the Ship is a 3 min walk , well sign posted coastal walks, Plymouth ( we used the bus from the village to get there), Saltram NT. The pub right next door to the cottage, the Swan, was closed during our stay for a refit, but the Visiter' Book suggestions about it are positive. The village has two excellent tennis courts and a boule pit. Across the river in Newton Ferrers, which you can walk to at low tide across the river, is another pub, post office/community shop, butcher and a Co-op. We also used Jon in the village(07967 133705) to do a boat trip along the coast and up the estuary. Communications with owner David before and after our stay were excellent, and our deposit was returned promptly. Thank you for your lovely review of 53 Noss Mayo! I'm glad to hear how much you enjoyed your stay there. We never set out to be an "Instagram house" and this is reflected in the fact that we don't charge "Instagram house" prices! It's nice to hear that you took full advantage of the village sports facilities and the bus service. I understand that The Swan is now open again with new management. I hope you will visit again at some time in the future. The nearest beach (Old Cellars) is a pleasant 40 minute walk, or 5 minute drive and 10 minute walk. The house is just over 10 miles from Plymouth and if you like walking or cycling then a car is not a necessity. There is a regular bus service every couple of hours to Plymouth via Yealmton. There are no longer any shops in Noss but over the river in Newton Ferrers there is a post office and general store, a chemists and a small but very well stocked Co-op. When the tide is low you can walk to Newton in a few minutes. It's about 20 minutes walk when the tide is in. There is a children's playground in Noss just behind the two tennis courts. All three local pubs (and the yacht club), are great for food and drink, and there are plenty of other eating places within a few miles. The nearest leisure centre is Ivybridge which has a nice swimming pool. For luxury food shopping can I suggest the Riverford organic farm shop in Yealmpton - they also have a great cafe! The house has free broadband Wi-Fi and a land line telephone. We ask people to leave money to cover calls to mobiles, calls abroad and anything other than short calls. Booking Notes: You will be expected to pay if you incur significant phone charges for international, mobile or long phone calls. Changeover Day: During the school holidays we reserve the right to only take bookings starting and finishing on a Friday. We always prefer Friday changeovers but outside the holidays we try to be more flexible. Prices: The price shown includes a 33% discount for bookings of 7 nights or more. This means that if you want 5 or 6 nights it is cheaper to book for 7 nights!